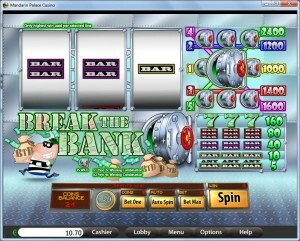 In Break the Bank, players will discover a classic slot machine which was created by Saucify. The slot has a few good features as well, so it doesn’t rely on a simpler gameplay style alone. As for the theme which was chosen in this case, you can easily guess that it’s inspired by bank robberies. The symbols are mostly classic ones, but you can see the bank robbery in the background, as it is taking place. One of the classic slots in Saucify’s collection, Break the Bank has 3 reels/5 lines. The wild and its multiplier would be the only major feature that is part of it. As for the big prize, you can win $2,400 inside. The slot offers only one special feature, a wild which can also apply a multiplier. The wild in question is the only symbol which is themed, showing you the Vault Door. A wild is capable of substituting for another symbol, as long as this action will result in a new combo forming. If three wild symbols form a combination on one of the five lines of the game, you will get paid between 1,000 and 2,400 coins, depending on which line is hosting them. When a single wild is part of a combo, with the rest of the line occupied by two regular matching icons, besides substituting for the third one it will also apply a 2x multiplier to the win. When two wilds do that, with the third symbol being a regular one, you get paid 4x what three regular symbols of that type would’ve given you. You get to use 1 to 5 coins, and you receive just as many active lines from the game. The later lines get better top payouts, so it’s not a good idea to play with fewer coins than 5. Each coin has a maximum denomination of $1, so the total bet goes to $5. Just how much you can win inside depends on the line on which the three Vault symbols form their combo. The first line gives you 1,000 coins, the second one 1,200 coins, the third line 1,400 coins, the fourth one 1,600 coins, and the fifth line goes to 2,400 coins. Given the maximum coin value, that means a top prize of $2,400. You will see in the background a scene where the bank robber is running away with a bag of money in his arms, grinning happily because of the score that he pulled. That robbery theme is visible in only one other place, in the Vault Door symbol which is used as a wild. Otherwise, you have simple white reels, with most of the symbols being classic ones, meaning 7s and Bars. Despite the classic influence, it’s a funny game and it could be a decent choice if this kind of simple title appeals to you. Symbols: Vault (wild, 2,400 coins), Dollar 7 (160 coins), Red Three Bar (80 coins), Purple Two Bar (40 coins) and Yellow One Bar (10 coins). The game is just as good as most slots that offer a similar layout, using the same features and payouts as most of them. It’s not very expensive to play, so you should give it a chance if the theme appeals to you. Break the Bank can be found at any Saucify/BetOnSoft casino, where you get a chance to play it for real money or in free mode.